WhatsApp is on a roll these days. The Facebook-owned instant messenger has unveiled many features, recently. And now in the latest move, the WhatsApp’s beta testing program has come to the limelight with a “video-calling” feature. Even though it is not functional but it does mean that WhatsApp is testing the feature and might roll it out soon. The feature has come in the new version, v20.16.80, of the beta testing program. The video-calling button is placed in the calling option, as seen in the images above. The calling option on the app shows voice-calling and video-calling buttons under it. Many of the testers in WhatsApp’s beta testing program tried to use the feature by tapping on the video-calling button. But sadly, they were greeted with a message – “Couldn’t place a call. 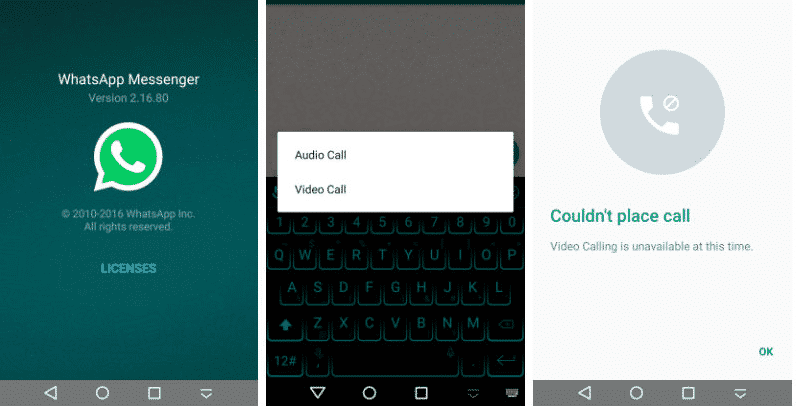 Video Calling is unavailable at this time.” The message prevails even when both the sender and receiver of the call are on the v2.16.80 of the Android beta program. Interestingly, the changelog mentions, “You get the option to make video calls, that’s not activated yet but soon would be available for everyone to make video calls.” The leaked images do not show any change in the visual interface of the app. Rumors about WhatsApp’s alleged video-calling feature had been making rounds for quite. Now, with the leaked images from the beta testing program, we are hopeful that the feature will soon be made functional. Are you looking forward to the video-calling feature by WhatsApp? If yes, then would you use it more than Skype? Let us know your opinion through the comment section below.